If you access a site from your mobile where the browser is mini the page displayed might be jumbled if the address you type is the 'www', e.g. http://www.mysite.com. Normally a site has its own mobile address. But if you forget the mobile address try to replace 'www ' with 'm'. For example, for the above web address try to type 'http://m.mysite.com' in your mobile. Not all sites are like that but at least it's worth to try. 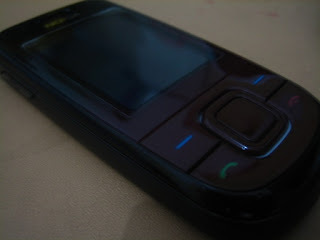 I’ve been using Nokia 3600 slide since January 2009 because my previous mobile which was Motorola was broken somehow. The price here in Indonesia was around $236 at that time. I didn’t even know that it can be used for Internet connection. The reason I bought it was solely because of its model. Nice, cute, slim (typical ladies!). On using it, I found that hey … I can connect to internet! No manual setting required. Simply plug in your sim card and you’re there. The beautiful thing is the built-in application installed namely Yahoo! Go where I can read and write my email in Yahoo. There is also mini Opera browser for me to ‘monitor’ (hmmm) my friends in Facebook or update my WP blog or browsing somewhere else. So, why don’t you try it? In previous post I discussed about post to blogger.com by sending email from your mobile. How to do it in WP? It's a little bit different. WP doesn't provide such email feature. However not like bloggerdot com luckily it has mobile address. In your mobile type http://m.wordpress.com. Enter your ID and password. Click Post. Yes, the editor is not as sophisticated as in www but it's good enough for you to keep updating your blog. Happy updating blog anytime anywhere! Sometimes when I pick up my daughter from her school and wait for her in parking land, I feel that I could have made use of my times to post some things for my blog instead of simply listening to the radio or having chit chat with other mothers in the school. Previously it was not possible for me to do so as I didn’t have mobile internet connectivity. Now that I have it, it’s so much fun to do that. Especially bloggerdotcom has provided a way to post by writing email to special account of ours. First of all, you have to set a special email in blogger.com (known as Mail2Blogger) from Settings>Email & Mobile. In Posting Options, create your Email Posting Address. You should keep this email as secret; otherwise people can post on behalf of your name. In your mobile phone, log in to your email sites (any sites can do, e.g. yahoo, google, etc). then create an email that is sent to corresponding Email Posting Address that is set above, mark the end of the post with ‘# end of post’ and click Send. It will be your new post right away! FYI, previous post with title “ABAP System Field” was posted from my mobile while waiting for my daughter in her school. Oh no ... You need to refer to ABAP field but your Help is gone somewhere, your ABAPer friend is on leave and your deadline is coming! Don't worry. It's all there in system itself. Use tcode SE11. Open structure SYST. Taddaaa ... They're all there waiting for you to pick up! Do you know that Facebook has chatting facility as well? By default, when we log into Facebook, the chatting status is set as Online. If you don’t feel like chatting, you just want to see your friend’s status or you just want to upload some photos of you, you can go offline with two clicks. Check out the bar at right side bottom part. There is Chat icon there with head picture. Click it, then click “Go Offline”. You are working in the last page of a long document in MS Word but you need to keep referring to the beginning of document? From the menu bar, select Window>Split. A split will be displayed, put it in the first part of document you need to refer to. After the split is placed, you can see the beginning of document and edit the last page at the same time without having to keep forward and backward in the document. If you want to use fixed parameter in formula in Excel then add '$' before and after the cell name. For example, in this screen shot you want the first parameter under column C is always A1, i.e. the first row of column A. Hence, the formula should be $A1$. When you copy the formula to other cells, the first parameter will always be A1, not An where n is the row number. Sometimes, a report that is customized or generated from ABAP requires extensive data processing. Surely, it takes time to generate the report. And if the run time is limited in your SAP system you will never get the report. Enhancing the report performance is one issue. Getting the report generated is another issue. You can increase run time to indefinite by setting the run time to 0. Tcode: rz11. Enter parameter name rdisp/max_wprun_time. Enter 0 in New Value. Click Save. Prerequisites: configuration has been set to display “Asset Shutdown’ in screen layout of corresponding asset class and depreciation key. Enter Asset Number and Company Code. Enter the date when to stop the depreciation of the asset e.g. 01.01.2009. Click OK. Tick ‘Shutdown’ check box. Click Save. You need to copy texts from SAP screen but you cannot drag your cursor to select them? Simply press Ctrl+Y that makes your cursor sign becomes ‘+’. Then the rest of them is as simple as dragging your mouse in Windows application. Once in a while you need to export reports that are generated in SAP system in PDF format. The easiest way is by running tcode SA38 and type RSTXPDFT4 (or you may create a tcode for the shortcut from SA93) and then click Execute. Oh, I forgot one thing, you need to print the report first and get the spool number. After you click Execute, type in the spool number. In next window system will prompt for file name to be. Type in file name you wanted. And voila ... you get your report in PDF format.